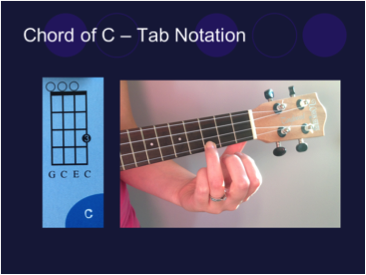 After deciding to create a scheme of work to make use of all the ukuleles I’ve inherited in the music department, I realised I was faced with the big challenge of teaching the students how to play them! I knew that some students would be excited by this prospect and that others would be completely out of their comfort zone and so I wanted to come up with a way of teaching them that meant everyone would be able to be successful and make progress. With practical music I generally find that some students work very methodically, working things out for themselves, while others like something visual to watch and then copy, which usually ends up being me stood in front of them. However, I wanted to give students some independence so that I was freed up to support those who were struggling most and to extend those who were finding it less of a challenge. 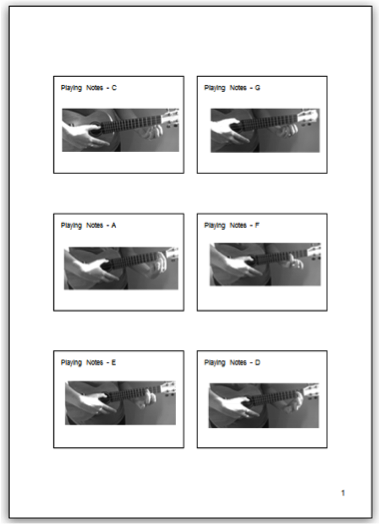 I got my husband to take photos of my hands in the various positions needed on the ukulele. 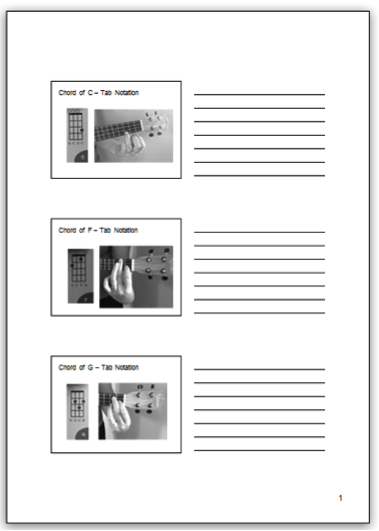 I then used these photos on my PowerPoint and also printed them onto handouts for the students, along with tablature (a form of graphic notation for ukuleles and guitars), giving students options for how to learn the chords and individual notes for the melody themselves. The use of photos on a handout has worked brilliantly well. In lessons that had potential for several students to be sat doing nothing, waiting for me to come and help them, I ended up with the opposite. Students could be guided to make a choice about what level to work at were grouped together based on their ability so that they could help and support each other. This gave students independence but also saw them helping and supporting each other. The feedback I’ve had from the students has been great, and even those that found it the most challenging still managed to achieve and make progress, without causing others to be held back.